The newest from MAC – Plenty of Pout lip collection – is supposed to be a bunch of things, but before I get to that, I have to talk about the promo photo. Umm ... someone somewhere thought having a bee on the lip is a fun image?! I get that they are going for the bee-stung lips concept, but I find the imagery just weird. 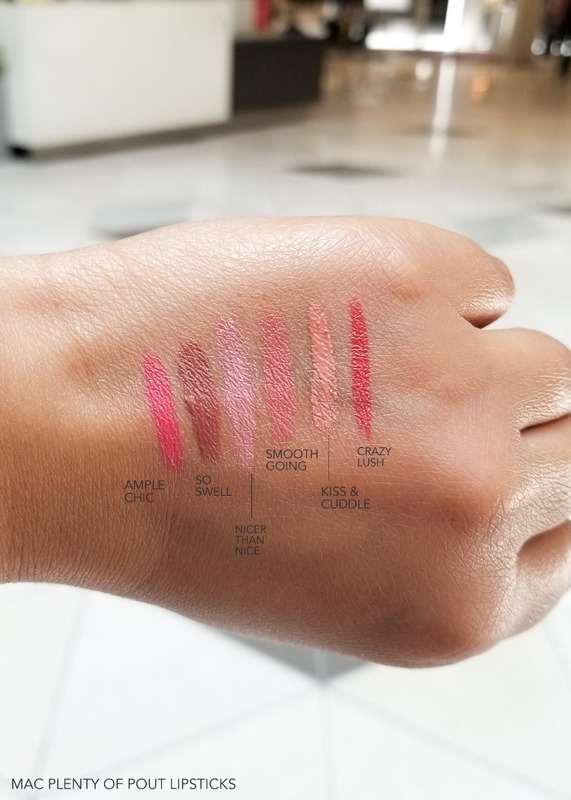 Anywho, moving on to the Plenty of Pout collection, it includes lipsticks (and a lipgloss) that promise full pouty lips and sheer, creamy color. The lip plumping effect comes not from bees (thankfully) but from ginger root complex that gives a cooling sensation to the lips and moisturizing oils that give a moisturized, smoothened effect. Most of the colors were sold out at my local MAC counter, but I did get some swatches to share here. Scroll on for more. The lipsticks live up to the smooth and creamy claim and feel quite moisturizing. While not as opaque as some of MAC's regular lipsticks (especially mattes), these do seem quite pigmented. The colors are the kinds that would work on most skin tones, and while this is a very small collection, I think MAC has done a good job with the mix of brights and neutrals. So Swell is a great neutral, but I also like Ample Chic and Crazy Lush. The moisturizing formula makes these colors easy to wear. Overall, I really liked the lipstick colors in this collection – not sure about the bee-stung lip-plumping effect – and the formula feels creamy and moisturizing. If you are looking for easy-to-wear lipsticks and/or want to try out the bee-stung effect without harming bees 😛, do give these a try!